This laminate flooring offers the look of grouted 12 in. x 12 in. 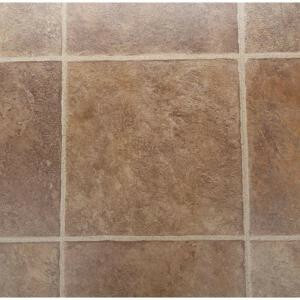 natural stone tiles in a durable, low maintenance laminate that can be installed on any level. Featuring an advanced inner core designed to resist moisture and a low gloss easy care finish to protect against spills, stains, fading and wear all backed by a 30-year residential warranty. Can be floated over most existing floors without messy glues. Exceptional quality, performance and value make Bruce laminate a worry-free choice, especially for active households with children and pets. 23.5 sq. ft. per case, case weight: 40.7 lbs. Buy online Bruce Pathways River Rock 8 mm Thick x 11-13/16 in. Wide x 47-49/64 in. Length Laminate Flooring (23.50 sq. ft. / case) L608008C, leave review and share Your friends.